Christmas 2015, in my household, was held hostage by Annie. Not, as my wife would prefer, the 1982 version of the hit Broadway musical, but rather the 2014 version, starring the wonderfully named, and equally talented, Quvenzhané Wallis. ‘It’s a hard-knock life’ and ‘Tomorrow’ received more Spotify playtime than Buble and Slade put together! My 6-year-old daughter (and, by default, my 4-year-old son) became obsessed with the tale of a young foster (orphan) kid given the opportunity to be adopted by a New York Billionaire. Seeing the stage version was like some kind of pilgrimage for these kids, and for my wife who remembered the original film with great fondness from when she was a similar age. It is a story tailor-made for little girls – the naïve but upbeat young Annie given the chance to live out every poor girl’s fantasy of living in a palace, always believing in a better tomorrow. In the best of ways, it’s a very simple tale, unconcerned with moral ambiguities and political subtexts. It could be seen as shallow and naive, but this is Annie’s story of endless hope, where anything can be resolved with a song. At times the message is stretched thin, such as Annie convincing President Roosevelt and his cabinet to pursue the New Deal for America’s economy – scenes that were rightly cut from the most recent film version. It’s a saccharine message which would be hard for the adult male to swallow, if it weren’t for the fact that the songs are just so damned, toe-tappingly catchy! Even as a cynical old man, I found myself caught up in the endless energy of the sprightly young lead, feeling an affinity with the wordly Daddy Warbucks (in attitude, not financial resource) and his journey of rediscovering his inner child. 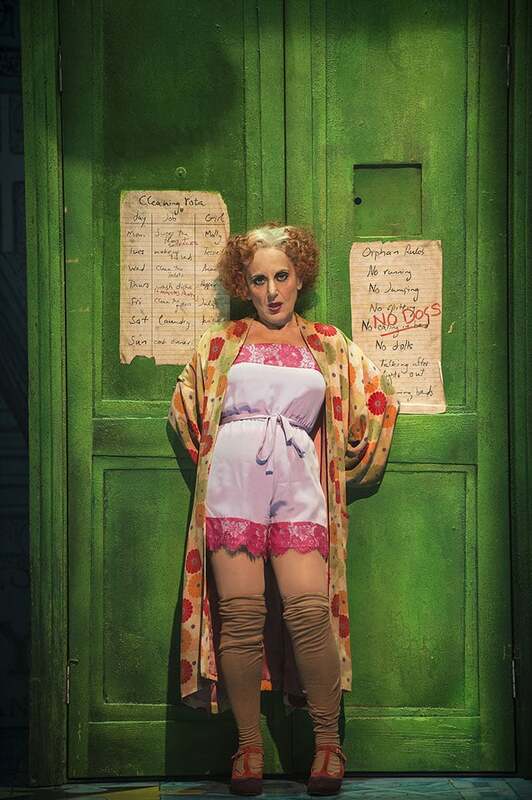 Lesley Joseph deserves special mention as the dubiously-motivated Miss Hannigan, her enthusiastic performance eliciting some of the greatest squeals and laughs from my children. However, it is the young cast that shine brightest, carrying the hopeful message with such zeal, that it’s impossible not to be swept up in their cause. Perhaps I’ve been infected by its cheesy optimism, but if, as one of the songs declares, ‘You’re never fully dressed without a smile’, then after a couple of hours of this show your outfit will be complete.